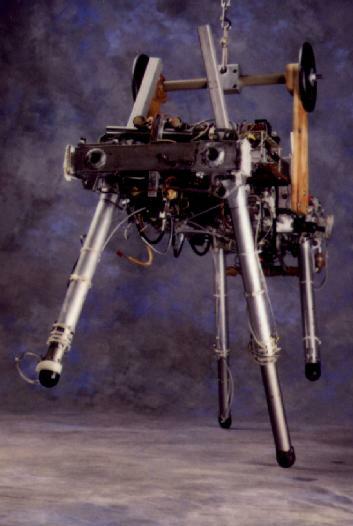 The Quadruped was used to explore running on four legs. We programmed it to trot, pace, bound, and do several transitions between gaits. We found that principles for one-legged hopping generalized to four-legged running, with the addition of a low-level leg coordination mechanism. We considered only those quadruped gaits that use the legs in pairs: trotting (diagonal legs as pairs), pacing (lateral pairs), and bounding (front pair and rear pair). By restricting consideration to the pair gaits, the control of the Quadruped was reduced to the control of an equivalent virtual biped. We found that each of the gaits that use the legs in pairs can be transformed into a common underlying gait, a virtual biped gait. Raibert, M. H. 1985. Four-legged running with one-legged algorithms. In Second International Symposium on Robotics Research, H. Hanafusa, H. Inoue (eds. ), (MIT Press, Cambridge), 311--315. Raibert, M. H., 1991. 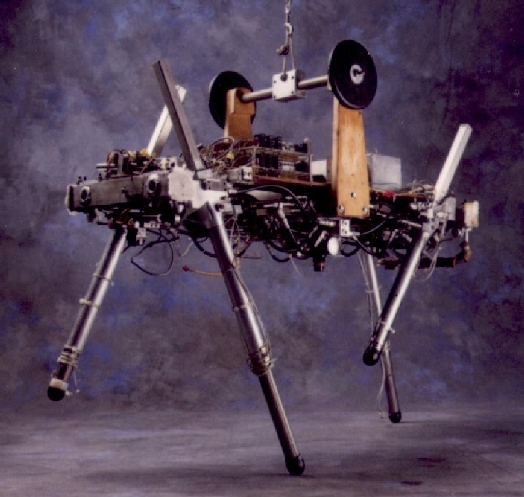 Trotting, pacing, and bounding by a quadruped robot, Journal of Biomechanics. Raibert, M. H., Chepponis, M., Brown, H. B. Jr. 1986. Running on four legs as though they were one. IEEE J. Robotics and Automation, 2:70--82.